The tittle is just alittle fun for you guys, I got this luxury topic from Tabnack.ir which I dont understand anything about it hahaha....but oh well if you are lucky enough to hang around on the streets in this car, make sure you dress up well that day huh! Because it's a gold-plated car. 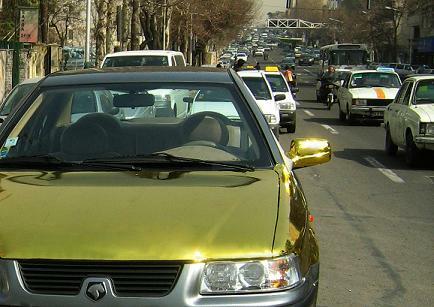 Locals in Tehran, Israel, went bonkers a few days ago when they spied a car that shimmered in the colour of gold driving around their not-so-filthy-rich streets. Not a mirage brought up by the intense sun, it turned out that the gold-plated car was actually supposed being transported to a Russian buyer with extreme secrecy when an unfortunate, or fortunate, accident caused it to appear on the streets. With the truck making the deliverance disabled, the owners were forced to drive the car to its next destination. 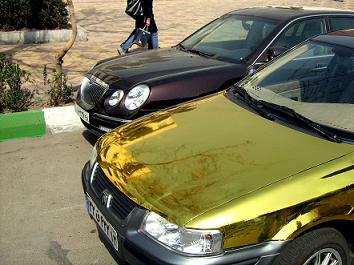 The car was not damaged in any way during the accident and the only thing that could possibly anger the new owner of the Samand LX would be the Tehran the cars gold exterior. The car was not made originally in gold by the manufacturer but was blinged up by two goldsmiths who saw pictures of a gold Porsche on the internet. The $1 million gold Samand LX is going to be part of the Russian’s private collection.